Stir-fries are such a blessing! Fresh ingredients, mixed with a can or two of goodies from the cupboard, can be combined with spices of our choice to provide a healthy and appetising, but quick, meal. This stir-fry dish is one of my favourites; because the whole thing takes less than half an hour to prepare, cook and serve it is one of the tastiest and simplest easy dinners going! Although the preferred ingredient for this dish is Baby Bok Choy - a pale green and succulent Chinese cabbage- use spinach instead if it is unavailable. 1. Cook the rice first in a large pan of boiling water. Drain and rinse thoroughly then cover with a lid to keep it warm. 2. Heat half the quantity of oil in a wok (or large frying pan) and stir-fry the chicken strips in batches, until all of it is cooked through. 3. Next, return all the chicken to the wok or pan and add the garlic, ginger, red chilli, Thai chilli jam, sweet chilli sauce and chicken stock. 4. 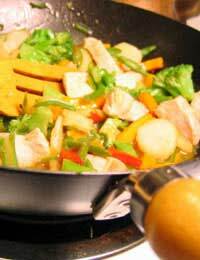 Stir-fry these ingredients together for about 2 minutes: the sauce should begin to thicken. 5. Transfer to a hot serving dish and keep it warm. 6. Wipe the wok with absorbent kitchen paper. 7. Heat the remaining oil in the wok. 8. Now stir-fry the bok choy, water chestnuts, onions and cashew nuts until the bok choy just starts to wilt in the heat. 9. Transfer the bok choy mixture to a warm serving dish. 10. Arrange the chilli chicken on top of the vegetable base. This is a very tasty accompaniment to loads of dishes; why not make your own? The basic sweet chilli sauce can be adapted to suit several different meals and will keep well (3-4 days) if refrigerated in an airtight jar. It may need stirring again before use though, particularly if honey has been added. As well as the stir-fry recipe suggestion here, sweet chilli sauce is also great with barbequed meat, fish or chicken goujons and corn-on-the-cob. It is also very useful as a relish in burgers and with sausages, too and gives wraps a little more ‘oomph’. 1. Heat the water and sugar together, over low heat, in a small saucepan. Do not cover. 2. Stir until the sugar dissolves then turn up the heat and bring to the boil. 3. Reduce the heat again and gently simmer until the sauce thickens-about 2 minutes. 4. Take the pan off the heat then add the vinegar and chilli. Stir well. 5. Taste and adjust if necessary. Add 2 teaspoonfuls of tomato puree for a denser, meatier, sauce. 6. To sweeten the basic sauce, add 1-2 teaspoons of honey. 7. For a hotter sauce, add more chilli or a few drops of Tabasco. Double up the quantities, as appropriate, to serve more people.